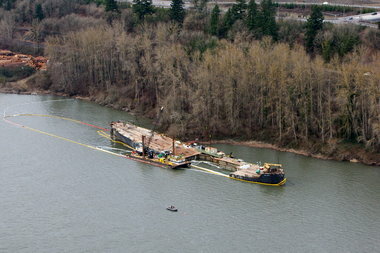 Washington is imposing a $405,000 fine on the scrap dealer whose botched salvage of the derelict barge Davy Crockett ended up spilling pollution into the Columbia River near Camas in 2011. Bret A. Simpson, of Ellensburg, Wash., purchased the 430-foot converted World War II Navy vessel in June 2010, prosecutors said, was told it had thousands of gallons of fuel oil and diesel aboard, but did not remove the contamination before authorizing workers to scrap it in December 2010. The barge cracked open, spilling oil, but neither Simpson nor anyone else with his company, Principle Metals, notified authorities about the leak. Had Simpson or the company sought a permit to dismantle the ship, Washington's Department of Ecology would have refused given the contaminants on board, Ecology officials said in a news release today. The 2011 spill prompted a 295-day cleanup and ship scrapping that cost taxpayers $22 million in federal funds and more than $680,000 in state monies, Ecology said. The cleanup included an 850-foot-long cofferdam to keep the river from being further contaminated. Investigators documented 70 gallons of oil spilled, Ecology said, but more than 5,700 gallons are unaccounted for. Jimmy Alford/Daily Record Simpson pled guilty in July to two criminal violations of the Clean Water Act: a felony offense for failing to report a discharge of oil, and a misdemeanor offense for negligently causing a discharge of oil to a navigable water of the United States. In a sentencing memo, federal prosecutors noted Simpson has "very limited resources," which could make cost recovery and payment of the fine unlikely. Simpson pled guilty in 1998 to illegally disposing of hazardous waste, the memo notes. He buried 20 to 30 drums containing waste oil, antifreeze and spent solvents on property he owned. Prosecutors are asking for a 13-month prison sentence, with home detention for six of the 13 months. They also want Simpson to complete 100 hours of community service with an "environmental nexus." Simpson is on personal recognizance release and has not missed court dates, his attorney said in court papers. His attorneys requested a delay in sentencing, originally set for last October, to allow time to respond to the prosecutor's memo. Sentencing is now set for March 11 before U.S. District Judge Benjamin Settle.